That special time of year when everyone asks what I’d like to have has come. Each year, my family and friends try to find the perfect unique items that match my chicken loving personality. This is the time I can ask for the chicken gift I’ve wanted, that I just couldn’t pull the trigger to buy for myself. After all, I usually spend my mad money on little extras to keep my chicken ladies happy! So what do you get for the chicken guru who seems to have everything? Here are my top 10 chicken gift suggestions for my friends, family and husband, comprising both my must-haves and past favorites, anything I think deserves a place on your holiday wish list, too! My tree always needs a new ornament each year. It’s a tradition: something that symbolizes the season and fits my personality, or that of my family. For chicken lovers, chicken ornaments are perfect. I love these glitter ornaments particularly. They have a country spirit, with twist of glam. A great gift has to have form and function, right? This basket would look lovely on our counter just to look at, but chicken lovers will be able to collect fresh eggs and get full use out of it, too. 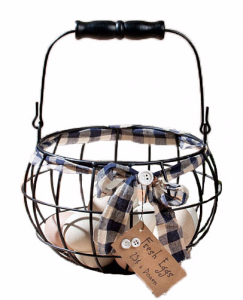 A cool egg basket is a great chicken gift! Any chicken fancying family could use this in the kitchen all year round. 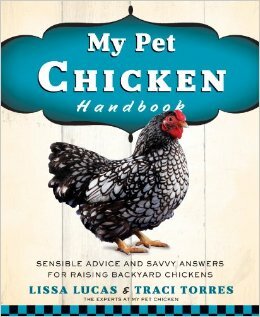 A chicken book is indispensable. 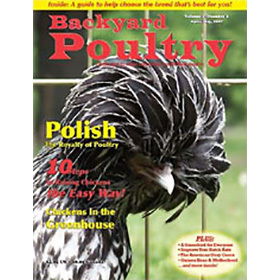 Plus, My Pet Chicken Handbook in particular is perfect for those just dreaming, or those getting ready for their first adventure in chicken keeping. It’s also a good way to bring people over to the dark side of chicken addiction. Er, light side of chicken keeping. (Durnit, you know what I mean.) But with the amazing breed list in this book showing winter hardiness, heat hardiness, foraging ability, egg size, lay rate and so on, it’s like a seed catalog for chicken keepers: you just read it over and over, and dream about what will be in your yard come spring! Nope, not a joke. (Okay, there’s no poop in it, so that part is a joke!) 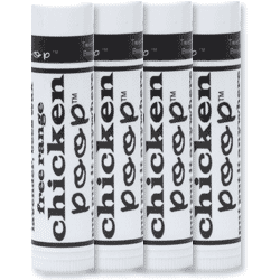 But it sure makes a great gag gift for my non-chicken friends. It’s a fabulous stocking stuffer, of course, and the best part is that it’s also a great lip balm to have in my purse when my lips are crying out for help from the winter cold. 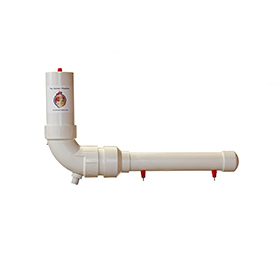 Now, this is a chicken gift for both the chicken lover in your life AND for the chickens. My chickens can’t free range, but I’m happy to let them wander with me safely at the end of the leash in our yard. Additionally, when I need to make a vet visit or head into town, this is a win-win chicken gift. Talk about a conversation starter! 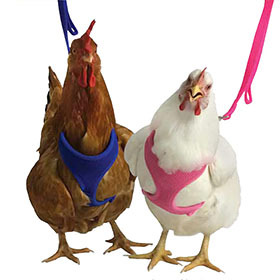 EVERYONE will ask you about your chickens when you take them for a walk on a chicken leash. Take me for a walk, please! 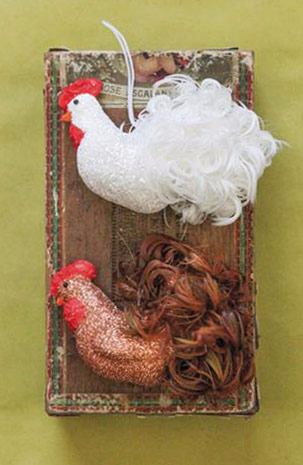 If your chickenista is crafty, this chicken gift is a must-have. 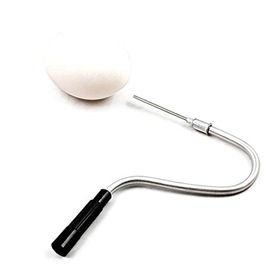 You’ll be able to blow out your own flocks’ eggs to save for future craft projects. Perhaps you just want to preserve the odd eggs you find one in awhile. Just think of the ornaments you can make with this for your family’s holiday tree for years to come! Lets face it, when chicken lovers can’t be out watching the flock, they want to be looking at pictures and reading articles about other peoples’ chickens. This magazine is definitely a nice surprise to find in the mailbox, and since it’ll be coming all year, what an awesome gift to enjoy long after the holidays have passed. In many areas of the country, it’s gotten COLD out there in the mornings. 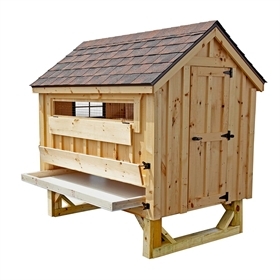 But cold or not, your chickens will want to go out first thing. If you free range, that means you’ll have to get up and trudge to the coop in the frosty wee hours to let the chickens out. Who wants to do that? Personally, I’d rather watch them happily scratching around the edges of the snow at 6am then be out in it with them. 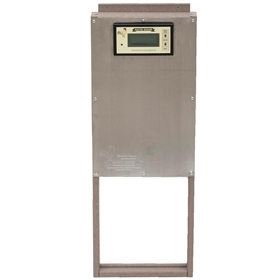 And if you can’t run electric, there is a solar conversation kit that will power your door. So this holiday season, have you made your chicken gift wishlist, yet? What made your list?